Yep, that's a BOB. If you run with a running stroller, you've probably heard of this brand. They get rave reviews from many, and many have recommended them to me. "Oh, Tara..." they say, "...you have to get a BOB." But they retail at, like...$300+ depending. Definitely not in my budget. That is, until now. The sweet score? They got the above for a whoppin' $70. Oh yeah. I actually have another running stroller. A hand-me-down that's a bit older and quite hard for me to maneuver, so the above will be great. I'm sure of it. Now, it's not in my presence yet so I can't speak to it's usability, but you can bet I will. From what I can decipher, it's a slightly older model. But it looks to be in great condition. I'm loving the rugged wheels, not that I'll go running off the beaten path, but I do live in a beach town and sand is everywhere. No seriously, it's everywhere. And little stroller wheels do not run through sand very well. Speaking of running well. I ran my first postpartum race this weekend. It was a small-town race, the Hartford Strawberry Run 10K. I live in a fruit belt of sorts, so there are a lot of little races peppered throughout the season. I love little races. If you like numbers, you'll appreciate the fact that I'm five months postpartum. Freaky coincidence, no? It would have been awesome if I had finished in 5th place, but I didn't. I actually came in 2nd in my age group. But what's funny is that I thought I had a crappy race. It was hot...and the back half of the course was straight, on a busy road that slanted and was full of sun. Ugh, right? And for some reason, my back was throwing a hissy fit. When it does, I get cramps in my lower right-hand side. This is not a postpartum gift, but a recurring thing. I can honestly say that I'm feeling pretty good when it comes to my running...no postpartum issues that I know of. So I dealt with my back by sticking with a comfortable pace. I couldn't tell you what that pace was, though. Somewhere in the upper 9-minutes, maybe even in the 10-minutes. I didn't care, I just wanted to run a race again. It had been over a year. And I was running with my mom, so I just wanted to have fun with her. She, by the way, also thought she was running a crappy race. But as it turns out, she finished 3rd in her age group. I mean, I kicked it up a notch in the back two miles to finish in 1:03, but that's almost ten minutes more than what I knocked out on a 6-miler over Memorial weekend. Crossing the finish line, I was content to receive the nifty white ribbon they handed out to each and every participant. And the funky tee. But this is what I love about small-town races: I emailed the race director, just in case our medals were still available, and they are. So we'll be getting them in the mail at some point. I wonder if they'll have a strawberry on them. I certainly ate a gigantic handful after the race. Well, anyway. That was Saturday. We spent a good chunk of Sunday on the bluff overlooking the lake. Not only was it nice to spend time with each other, we got to catch up with some friends of ours that were in town. Doug and Laura used to live here. The hubs and I used to work with Laura. We miss them (sad face). We miss the weekend, too. Question: What was the highlight of your weekend? It was so good to see you guys too and meet your sweet girl!!! You'll be happy to hear we made it home without incident (read: no pullovers and no hitting of the house). Holler! 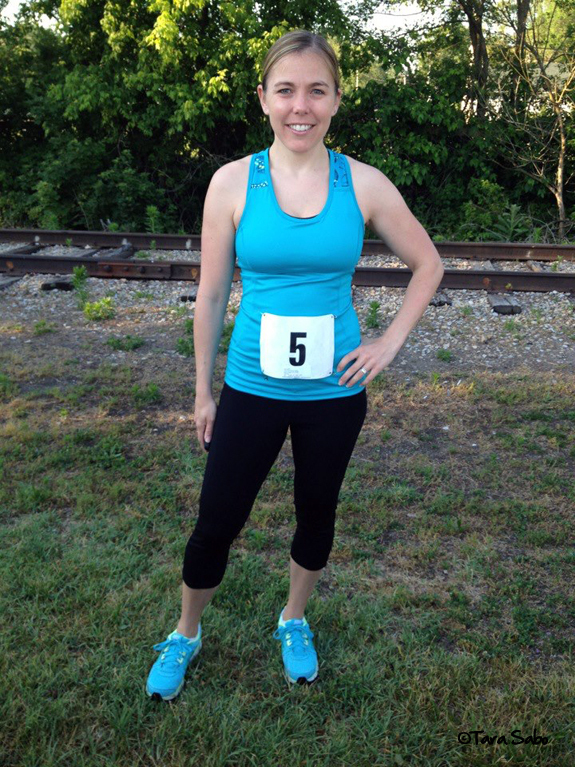 Congrats on your first postpartum run! I'm looking forward to entering a few races next year after I have the baby. Right now I'm just happy I can jog (slowly!) on the treadmill. Are you getting any funny looks from people who can't believe you're preggo and running? I did. All the time...it just made me keep going :-) Happy running! I'm sure baby loves it! Glad to hear the trip home was good...poor Doug. He has the worst luck with driving! Ha! How can a mom find time for fitness?